Cite as: Jorge E. Hernández, Janusz Kacprzyk, Andrew Lyons, Angel Ortiz, Hervé Panetto. Review on operational research advances in agri-food supply chains and societal challenges. 29th European Conference on Operational Research, EURO’2018, Jul 2018, Valencia, Spain. Abstract: Food production and growth has increased since the end of the last 20th century in response to the high increment in population. Therefore, a challenge for setting efficient and optimal Agri-Food Supply Chains is a multi-disciplinary need, where Operational Research has a key role to play to support Agri-Food Supply Chain decision-makers. Several risks and uncertainties (food safety, weather, volatile market conditions and commodity prices), faced by stakeholders, are making the Agri-Food Supply Chain Management a complex task. From the literature, several research questions are identified, such as: an optimised Agri-Food Supply Chain structure will reduce the administrative barriers once facing tariff cuts or changes in administrative regulations? ; Can distorted competition risks be minimised by optimising trading policies? ; and can the enhancement of food standards optimise Agri-Food Supply Chains performance and sustainability?. Therefore, and based on the on-going work under the H2020 RUC-APS research project network, this research work is oriented to contribute to Agri-Food Supply Chains decision-making field by covering, reviewing and analysing the current trends in Operational Research for supporting Agri-Food Supply Chains decision-makers, in special the multi-disciplinary real industry life challenges. This within the objective to propose an integrated framework based on standardised Operational Research structures to cover the key current key challenges. Cite as: Hernandez Hormazabal, JE, Sauvage, Cecile, Rushton, Jonathan, Lyons, Andy, Drake, Paul and Manish, Shukla (2018) Understanding and Gathering Decision-Making Challenges in EU Agri-Food Systems with Uncertain Regulations. A MCDM-AHP analysis. In: N8 AgriFood Conference, 2018-06-13 – 2018-06-14, Liverpool. Abstract: The development of the Agri-Food sector in both the UK and EU is a government priority, especially in building more resilient and sustainable Agri-Food Supply Chains, which are also subject to a variety of local and global regulations, determined the Common Agricultural Policy or the World Trade Organisation. Understanding Agri-Food Supply Chains requires a detailed understanding of upstream and downstream relationships amongst suppliers and customers. However, considering the current regulation changes in EU, UK/EU Agri-Food decision-makers, are facing several market challenges, especially in adapting to the externalities they cannot control (technological innovation, new nutritional market demands, economy, political markets, food security and climate change). Based on the N8 SIMULAGRIT project, this research aims at identifying factors, both opportunities, and constraints, that currently influence Agri-Food Supply Chains performance once uncertainties in regulations are identified. Thus, and based on case studies from the UK, Spain, Italy, ​and Chile, a compressive AHP study of alternatives Agri-Food strategies to deal with such uncertainties has been carried out. From this, it is depicted that key criteria are in the context of Finance, Supply Chain and Logistics, Human Resources and National/International trade. Thus, the research work has helped to identify and evaluate a set of strategies which may be used to support further policy-making processes and scenarios. Abstract: Agri-food supply chains (AFSC) profits are dependent on products quality. Consumers require a minimum quality for products and pay a higher price for them than for non-quality products. Problems arise when farmers have difficulties in obtaining products with the quality standards required. Farmers are forced to waste the harvest not meet- ing the quality standards. This impacts on the quality products sales, and on the profits of the whole AFSC. Collaboration can be used to in- crease the quantity of quality products harvested. Modern retailers can fund small farmers to improve their knowledge in farming techniques and the technology for the fruits and vegetables production. Unfortu- nately, the proportion of quality products to be obtained at each har- vest and its improvement with each fund are uncertain. If uncertainty is not considered in models, the expected results will not be achieved when implementing a solution to a real AFSC. A fuzzy model based on Wahyudin et al. (2015) to select the funds to be made to maximize the AFSC profits is presented. The main novelties of our approach are: 1) the uncertain modelling of the proportion of quality products and its improvement with each fund, and 2) to include the possibility of re- jecting demand and wasting harvested product. A method to select the solution that better balances its feasibility and the decision-maker sat- isfaction is employed, determining the funds to be finally implemented in the AFSC. Abstract: Change in products, process, technology and markets are significantly contributing to an increase in the uncertainty level of the Supply Chain. The result is that the companies must take decisions with less information or more ambiguous, on shorter times and with higher penalty costs. In the agri-food sector, managing the uncertainty is especially important, not only to control the effects of these factors, but also because it is a sector characterized by the existence of large sources of uncertainty throughout the process, from the growing in the countryside to the conservation in the retailers’ shelves, with perishable products, special transport requirements or treatment of products that can suppose health risks. In this paper, a framework of analysis is presented to evaluate the impact of the sources of uncertainty on three key aspects (quantity, quality and time) for each of the stages of AF-SC and at each decision level (strategic, tactical and operational). Cite as: Ortiz, A., Alarcón, F., Pérez, D. and Alemany M.M.E (2017). “Identifying the main uncertainties in the Agri-Food Supply Chain”. Presented at International Join Conference 2017 (ADINGOR, ABEPRO, IISE AND ASEM). UPV-VALENCIA (Spain) 6th-7th July 2017. To be published on SPRINGER in 2018. Abstract: The Agri-food Supply Chain (ASC) has received increasing attention lately due to environmental and social impacts. This is likely to lead to tighter regulations and closer control of these supply chains, where the traditional ASC practices will be reviewed and changed. One of the key solutions may be the necessity of establishing procedures accounting for the sustainability of the whole ASC. This is directly related to the increasing presence of different ASC third parties offering this type of services. In this paper, different aspects about ASC sustainability are reviewed from the literature, with the aim of finding out which are the most addressed and remarkable ones. These ones will be used as a benchmark against an example of a real sustainable ASC management model implemented by the UK established company (LEAF-Linking Environment And Farming). Cite as: Pérez D., Alarcón F., Drummond, C. and Ortiz, A. (2017). “Towards a Sustainable Agri-food Supply Chain model. The case of LEAF”. Presented at CIO 2017: XXI Congreso de Ingeniería de Organización and 11th International Conference on Industrial Engineering and Industrial Management. UPV-VALENCIA (Spain) 5th-6th July 2017. To be published on SPRINGER in 2018. Abstract: Increasingly challenging global and environmental requirements have resulted in agricultural systems coming under increasing pressure to enhance their resilience capabilities. This in special to respond to the abrupt changes in resource quality, quantity and availability, especially during unexpected environmental circumstances, such as uncertain weather, pests and diseases, volatile market conditions and commodity prices. Therefore, integrated solutions are necessary to support the knowledge-management, collaborative ICT solution, risk management and regulation management across agriculture stakeholders. Therefore, and based on the on-going work under the H2020 RUC-APS project research network, this book chapter is oriented to contribute to agriculture value chain decision-making field to cover the current need on gathering a common understanding and appreciation of new trends in agriculture value chain, in special the multi-disciplinary challenges. For this, a short a literature review is conducted to summarise the main findings on real application and current research trends. This within the objective to propose an integrated framework based on better use of communication ways, standardised structures, development of training and awareness, regulation based initiatives and vertical Integration. Abstract: Agri-food supply chains are subjected to many sources of uncertainty. If these uncertainties are not managed properly, they can have a negative impact on the agri-food supply chain (AFSC) performance, its customers, and the environment. In this sense, collaboration is proposed as a possible solution to reduce it. For that, a conceptual framework (CF) for managing uncertainty in a collaborative context is proposed. In this context, this paper seeks to answer the following research questions: What are the existing uncertainty sources in the AFSCs? Can collaboration be used to reduce the uncertainty of AFSCs? Which elements can integrate a CF for managing uncertainty in a collaborative AFSC? The CF proposal is applied to the weather source of uncertainty in order to show its applicability. Cite as: Esteso A., Alemany M.M.E., Ortiz A. (2017) Conceptual Framework for Managing Uncertainty in a Collaborative Agri-Food Supply Chain Context. Working Conference on Virtual Enterprises PRO-VE 2017: Collaboration in a Data-Rich World pp 715-724. Abstract: The OECD, in 2005, has reported that in average pesticides are used at a total of 0.21 kg ha-1 (CEPAL/OCDE 2005) and also that Chile has one of the highest levels of pesticide usage (10.7 kg ha-1 in 2009) and, nowadays, the lack in terms of knowing where pesticide residues fate (spcially in soil and water) still remains in Chile. Therefore, the purposes of this study was to validate QuEChERS method in soil samples for a representative population of pesticides, thus to quantify the concentration of pesticide’s residue over the Metropolitan’s agricultural soil region in Chile, for this purpose the lettuce was selected as a fresh vegetable product. To the analytical methodology, soil samples were collected from a variety of places, in special where no pesticides were applied (Lampa’s Metropolitan region located at S° 33”, 17: W° 70”, 5). The monitoring process was conducted during three lettuce’s rotation in the season 2016. 12 samples, from each rotation, were collected to monitor the pesticide residue level. The method was validated according to the SANCO document 12571/2013 guidelines for boscalid, imidacloprid, pyraclostrobin, thiamethoxam, lambda-cyhalothrin, linuron, methomyl. The limit of quantification (LOQ), which was defined as an acceptable recovery (70-105%), started at 0.01 mg kg-1. The precision, which was expressed as the relative standard deviation (RSD, %) at three levels (n = 5/level), was set at <20%. The average recovery of the different pesticide varied between 70% and 105%. The pesticides residues were determined using the QuEChERS method using gas chromatography (GC-NPD, GC-ECD, and GC-MS) as well as high-performance liquid chromatography (HPLC). The obtained recovery pesticide residues values varied from 75% to 105%, which is aligned with the European Commission Regulation desired recovery percentages. In addition, the RSD was 0.5-15%, which is lower than the 15% required, therefore the extraction and clean-up was also validated. Amongst the detected pesticides, methomyl showed the highest concentration (0.98 mg kg-1), followed by boscalid (0.15 mg kg-1), and imidacloprid (0.05 mg kg-1). Imidacloprid, thiamethoxam, linuron and methomyl were the most predominant compounds found in all the samples. In fact, these levels of linuron and imidacloprid certainly might induce adverse effects on in the environment. Hence, the novelty of this research is, through this real based data analysis on pesticides, is oriented to enhance the understanding on how important pesticides residues in soil are, therefore, this will lead to improve the methods on pesticide usage and also to promote integrated pest management programs in Chile. Cited as: Elgueta et al. (2017). Validation of QueChERS Method and monitoring pesticide residues in the metropolitan’s agricultural soil region of Chile. SETAC Europe 27th Annual Meeting. Brussels, Belgium, May 6-10, 2017. Abstract: To guarantee the right supply of food, the use of pesticide has become a well-known practice once managing the crops. However, the inefficient use of them, especially in the horticultural based fresh products, has implied an increment on agri-farming pollution related as well as a reduction on optimal environmental levels, which implies an increment on human health risks. Hence, and more than ever, establishing the right key performance indicators (KPI’s) to monitor chemical levels in fresh products, as well as to assess their risks to human health, it is crucial and justified to realise the main effects and reasons from these risks. There are several KPI’s for measuring and estimate the amount of chemicals in food, being the acceptable daily intake (ADI) one of the most well-known KPI which is expressed as mg kg-1 body weight (bw) day -1. ADI is used then to predict the daily intake during a lifetime and contributes to determine the estimated daily intakes (EDIs) to reduce risks on health. Nevertheless, a lack of information regarding the assessment of the acute and chronic health risk still exists. Moreover, and in the special case of Chile, healthy risks related to leafy vegetable based fresh foods is still one of the major challenges and issues that requires to be studied. In this context, most of research works has conducted a study over 118 leafy vegetables in order to determine the level of pesticide present in this population. For this purpose, the samples were collected from 2014 to 2015, and are coming from a representative geographical area of Chile (the North Central). Thus, to measure the level of pesticides, the multiresidue QuEChERS method, using gas chromatography (GC-NPD, GC-ECD, and GC-MS) as well as high-performance liquid chromatography (HPLC), was considered. The outcomes highlights that 27% of the samples contains pesticide residues over the maximum limits from each active ingredient. In addition to this, the maximum EDI obtained for carbon disulphide (CS2), methamidophos, azoxystrobin, and cypermethrin were 0.57, 0.07, 0.06, and 0.05 mg kg-1, respectively. These figures are out of range considering their ADI’s. Therefore, this study concludes that inhabitants of agricultural areas of Chile are not exposed to health risks, specially through the consumption of leafy vegetables with the exception of methamidophos. Nevertheless, the high levels of methamidophos detected in leafy vegetables could be considered a potential chronic health risk. Cited as: Elgueta et al. (2017). Assessment of the acute and chronic health risk in leafy vegetable in Chile. SETAC Europe 27th Annual Meeting. Brussels, Belgium, May 6-10, 2017. Abstract: Current global requirements are stressing agricultural systems to achieve enough resilience capabilities once abrupt changes in resource quality, quantity and availability occurs, especially during uncertain weather, pests and diseases, volatile market conditions and commodity prices conditions. Thus, managing risks and the uncertainties in information will lead farmers and value chain stakeholders to better react to these unexpected conditions. 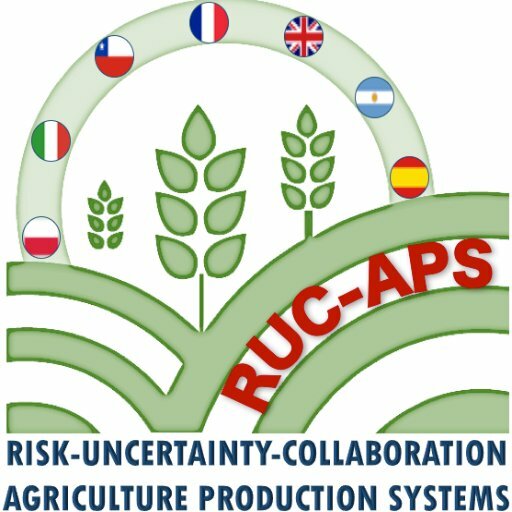 Hence, from the genetic design of the seed, through the planting and harvest processes, RUC-APS will enhance the knowledge from the full agricultural life-cycle based-decision making process to realise the key impacts at every stage farming decisions once facing high risk and uncertainty. Thus, RUC-APS will provide an integrated standard and customised solutions to enhance collaborative agriculture value chains structures.